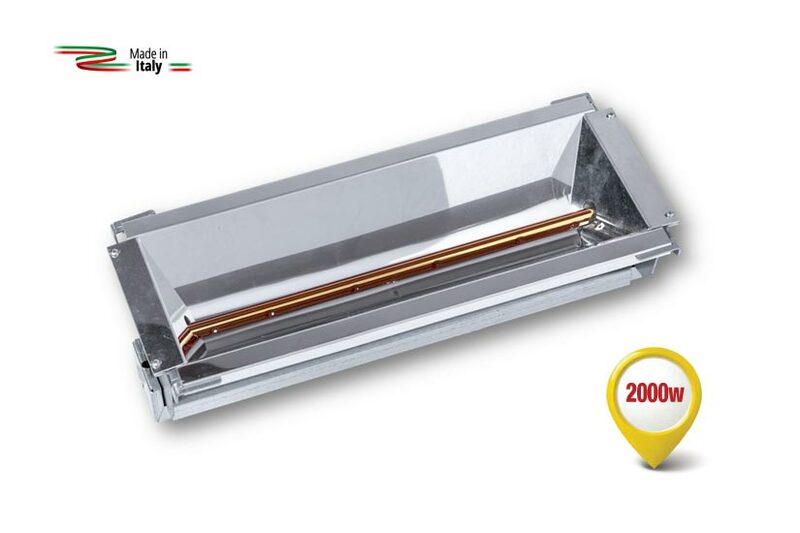 Radiant infrared heater equipped with the new special lamp with a Fast Medium-Wave. General Catalogue Internal Radiant HeaterRadiant infrared heater equipped with the new special lamp with a Fast Medium-Wave. Approved for installation at 90° from vertical (facing to worktop). Special infrared heater equipped with an IRK lamp with a shortwave. Interchangeable one-piece reflector body. “SUPERMIRROR” aluminium reflector with a very high reflecting power with a thickness of 10/10. IR halogen lamp custom-built with a shortwave, Teflon cable, and silicone glass fibre – reinforced body. Holder with galvanised sheet. Terminal box in a metal box. Wired with special type of cables resistant to high temperatures. Nickel/copper and teflon coating. Remote heat transfer between two bodies with no contact. Designed for indoor use inside the public works vehicles for remote heat transfer between two bodies with no contact. Product dedicated to the use in: IR tunnel, IR ovens, dryers, catalysts, paint-spraying booths, etc. Professional use for silkscreen printing industry, drying of plastisol, resins, paints, adhesives, leather industry, bonding, softening, drying, printing, drying of marble, tiles, paints, microgranules, technopolymers, textiles, metals, leather, plastic products, cooking and food preparation, maintenance of food temperature.